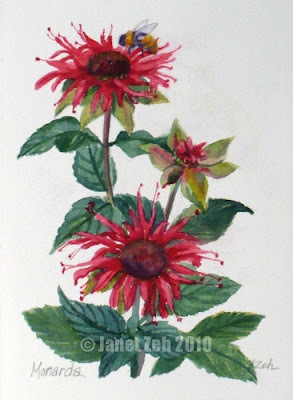 Bee Balm is a nice flower to have for color in July and early August. The red varieties are especially attractive to hummingbirds. The flowers and leaves are great in a potpourri and are used for medicinal teas. In this painting, I've added a bee to the topmost flower. There is never a moment while the sun is out that these flowers are without bees!